[1.0.2.1] Tactician - Gunning down crucible, sound weird? After this run I made 3 more, same thing, build is tier 1 cruci farmer definitely. 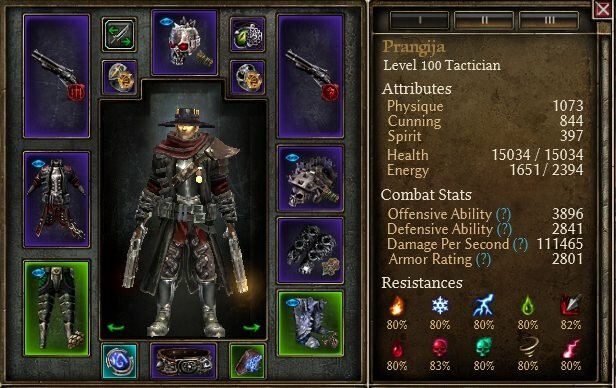 My first char in grim dawn was sorcerer gunslinger and it sucked, period. For long time DW gunners were so underdoged that it wasn't even funny. They are underdogs even now frankly speaking, but there are few items that can really make gunslinger work Mythical Havoc is one of them. Why mixing phys and pierce dmg why not going all pierce or all phys? All guns have somewhat unfortunate AP ration on them so you can forget about pure phys dmg route. If you decide to go pierce dmg route than one deathdealer sidearm and one cheesed sinister prefix green revolver would be better choice (you can buy one like that from merchant in Gloomwald if you are lucky I wasn't so far), but after they gutted Valdun set, for anything that is not 2H ranged, I dont feel that there is appropriate gear support for going pierce gunslinger. Why 2x havoc and not death dealer sidearm? Simply I think havoc is much better rounded for using cadence with higher emphasis on phys dmg. Yes it has lower base dmg and lower flat addition, but it has higher base atc speed, higher bonus to atc speed, higher ADCTH, much more useful skill bonuses (never had easier time reaching 22/12 Deadly momentum), high OA bonus and most important much lower AP ration, 25% compared to 33% on deathdealer sidearm. Lower AP ratio alone means so much, its like having 8% more preferable dmg. Why is for this build phys dmg more preferable? Simply, you have much better gear/resistance reduction support for it. 3pcs of warborn are giving you uber defensive and offensive stats, useful skill bonuses and ability to have war cry perma up, due to CDR to warcry on warborn helm. Havoc and Warborn set do not give any % dmg bonuses to pierce so you will end up with like 1000% more to phys than to pierce dmg, despite trying to boost pierce % trough devotion setup which I did. 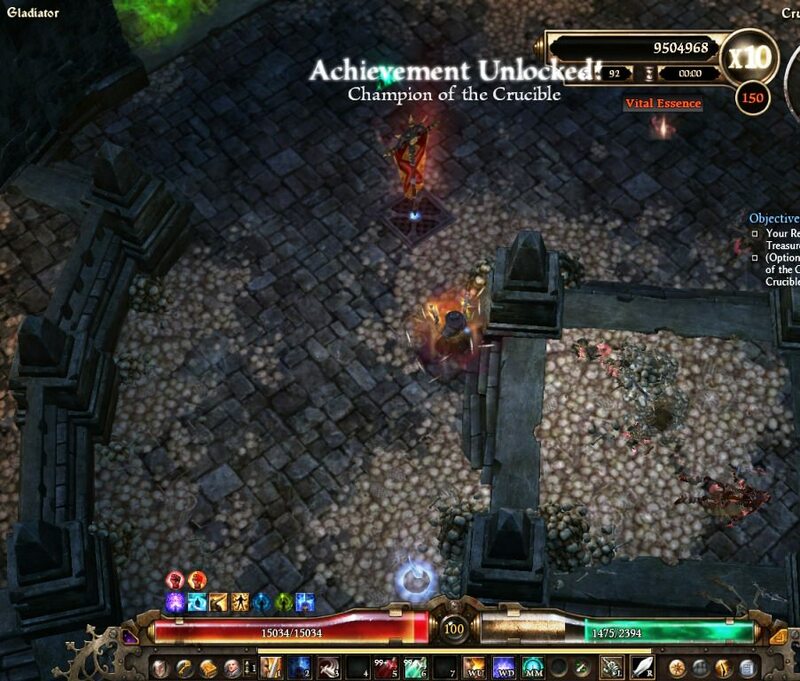 With 4 to soldier and 3 to inquisitor on top of all that juicy skill point bonuses from warborn set pieces and havoc, you have more than enough skill points to play around, with last few honestly I didnt know what to do so pumped bursting round to 10/10. You can if you like add more points to break morale but imho flat 30 rr is more than enough and high bursting round lvl net you really strong AOE clearance, so imho, specially for cruci it pays off to go like that. I didnt took any other of inquisitors wps cuz frankly they look like dps lost to me, not huge but again significant. Btw dummy kill time for this build is 35 secs with setup like this, it could go up with higher break morale investment but even 35s is not bad for dual guner at all. Adjust cunning and phys investment to your liking, spirit just to meet with gear requirements. Basically you can go much more cunning and maybe i will rework it in that fashion, but for now I wanted high HP and DA for cruci thus invested more than is needed for gear requirements in physique. 2x Havoc, 3pcs Warborn, ring of black matriarch, bladetwister signet, rest is changeable and adjustable to resistance capping requirements. I personally wouldn't change peerless eye, reforged chains and grasp of unchained might, for rest do as you will. Last edited by JoV; 11-15-2017 at 02:49 PM. Looks hot as always. Is it possible with 2h tho? Thx, like this, I dont think so, but you have other options for 2h. You could go pure pierce which would be me my advice for 2H. Hey, JoV. You are great. Keep up doing what you doing, man. Huh? When did this happen? What about deathdealer + havoc combo? Last edited by Chthon; 10-26-2017 at 04:17 PM. Why you didn't take other Inq WPS, not worth with Cadence?? Last edited by korsar; 10-26-2017 at 04:23 PM. You could call it done.